Born in Matane, Québec in 1969, Hugues Canuel graduated from the Collège militaire royal de Saint-Jean in 1991 and then served in various ships of the Pacific and the Atlantic Fleets as a Diving, Navigation and Communications Officer; Operations Room Officer and Anti-Air Warfare Controller; and Fleet Combat Officer. He traveled to Northeast Asia in the frigate VANCOUVER (1994) and Southeast Asia in the destroyer HURON (1997), and deployed with NATO’s Standing Naval Force in the frigate VILLE DE QUÉBEC (1999) prior to joining the destroyer IROQUOIS in October 2001 for the first deployment of Canadian military forces to Southwest Asia in the wake of the dramatic events of 9/11. Upon returning to Canada the following year, he was transferred to the staff of the Commander Canadian Fleet Atlantic. Captain Canuel then served at National Defence Headquarters in Ottawa with the Directorate of Maritime Strategy (2004) and completed the Command and Staff Course at the Canadian Forces College in Toronto in 2006. That same year, he was appointed as Executive Officer in the frigate OTTAWA as the ship deployed to the Persian Gulf and the Horn-of-Africa region as part of Canada’s maritime contribution to the campaign against terrorism. 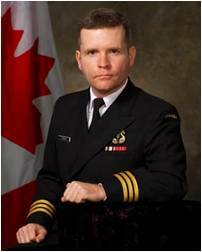 Captain Canuel returned to Maritime Staff Headquarters in 2007 to serve as Director of Strategic Communications, transferring to the post of Executive Secretary to the Chief of the Maritime Staff in 2008. Captain Canuel was appointed in January 2009 as Executive Officer in the replenishment ship PRESERVER, and then took command of the “Heart of the Fleet” in December of that same year. Captain Canuel holds a BA in Military and Strategic Studies from the Collège militaire royal de Saint-Jean (1991) as well as Master’s degrees in War Studies (2001) and Defence Studies (2006) from the Royal Military College. He resides in Toronto with his wife Misuzu Sukenaga.